ATLANTA (January 22, 2019) Incident IQ, the technology support platform built for K-12, has released a new update to the Incident IQ platform with the Winter 2019 Release. K-12 technology teams will find a host of new features to help them better support instructional technology. Improvements to the Google Device Data (Chrome Console Integration) and Microsoft SCCM integrations allow instant assignment of devices to students through a simple login, as well as two-way sync capabilities, allowing changes to assets made in Incident IQ to be reflected in a district’s device management software. Analytics Explorer improvements provide real-time updates to analytical data, and the ability to toggle between charts and data dashboards and the individual tickets that make up the visualization. Enhanced Filtering Engine helps users locate assets, tickets, and users quicker than ever before. “We’re thrilled to be unveiling this new update, which contains features that will save users a lot of time, and allow them to support district technology better than ever before,” said Jason Martin, Chief Software Architect for Incident IQ. Asset management integrations have been improved significantly. Districts can instantly assign a device to a user after the user logs in to the device. Two-way sync functionality allows changes made in Incident IQ to be reflected in a district’s systems management software, allowing instant parity between the two systems. Analytics have been enhanced with real-time reporting. Changes made to tickets will now be immediately reflected in analytical data. Additionally, with one click, users can toggle between analytical data and the underlying tickets that make up those analytics. Users can also use filters to refine a group of tickets, then toggle to view analytical statistics related to these custom data sets. Ticket templates have been upgraded, allowing quick access to common issue submission. This feature allows pre-defined tickets to be applied to a single asset or multiple assets in seconds—saving users a significant amount of time when working with assets in bulk. Ticket templates can also be shared between users, allowing for simple circulation of templates across a technology team. Users will also find additional improvements throughout the product. An all-new Notification Center keeps users up to date on changes made to any tickets they’re attached to. Filters have been overhauled with a new look and feel, dividing filters into different categories. Additional filters have been added related to calendar-based filtering, as well as SLA performance filtering. 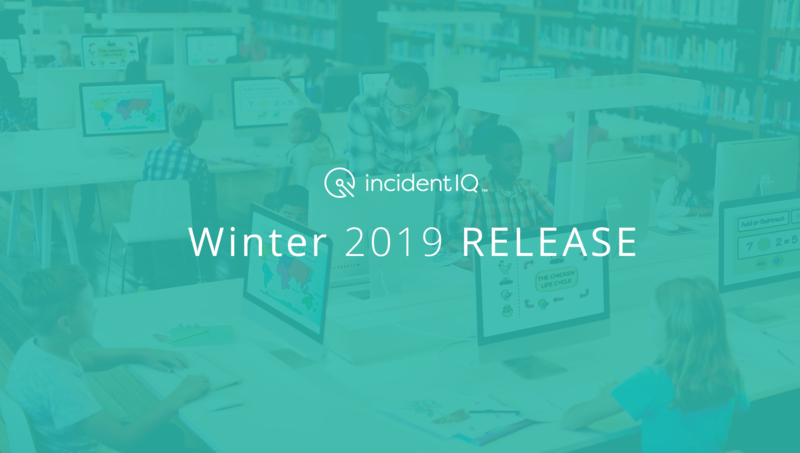 To learn more about Incident IQ and the features contained in the Winter 2019 Release, visit IncidentIQ.com. INCIDENT IQ and the stylized INCIDENT IQ logo are trademarks or registered trademarks of Incident IQ, LLC. All other trademarks are the property of their respective owners. © 2019 Incident IQ, LLC. All rights reserved.